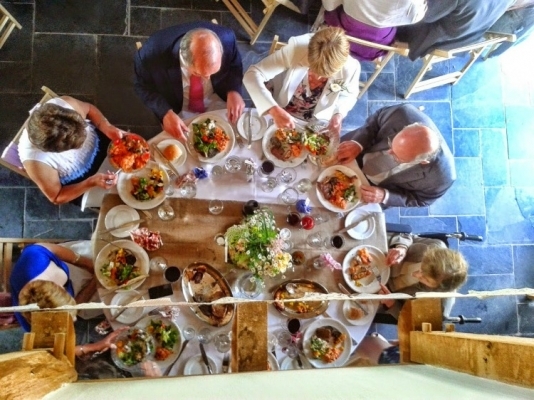 Rumbold’s Barn in West Sussex was the charming setting for Lauren and John Du Preez wedding reception where Buzz Events cooked up a special wedding BBQ. The idea of holding a barbecue at a wedding might seem a surprising choice. After all, nobody wants their guests having to wait patiently in a long queue with an empty plate in hand when they should be wining and dining, relaxing and chatting with friends and family. Even worse, what if it rains!? Luckily, neither of these concerns need be an issue. For Lauren and John’s special day we provided a sizzling sit-down BBQ food service straight from our charcoal grill. There was no queuing at the barbie and no need to worry about the weather. Instead they could just sit back and enjoy a delicious range of meat and fish platters (and a tasty vegetarian alternative) cooked to perfection, plus a choice of freshly prepared seasonal salads. Feel free to take a look at our barbecue menus to find out more. Our aim was to create a delectable culinary experience that would perfectly complement the joyous occasion. The sight of guests passing around the mouth-watering platters, accompanied by the excitable hum of conversation and the clinking of glasses was a good indication that we’d been successful. However, it’s about more than just the food. We also pride ourselves on ensuring that every aspect of the wedding reception is taken care of.